Idaite: Mineral information, data and localities. Very close to Cu5.5FeS6.5 according to Sugaki et al. (1975). Named for the type locality, the Ida mine in Namibia. A lamellar decomposition product of bornite, commonly associated with fine spindles of chalcopyrite; apparently of secondary origin, a first product of enrichment. 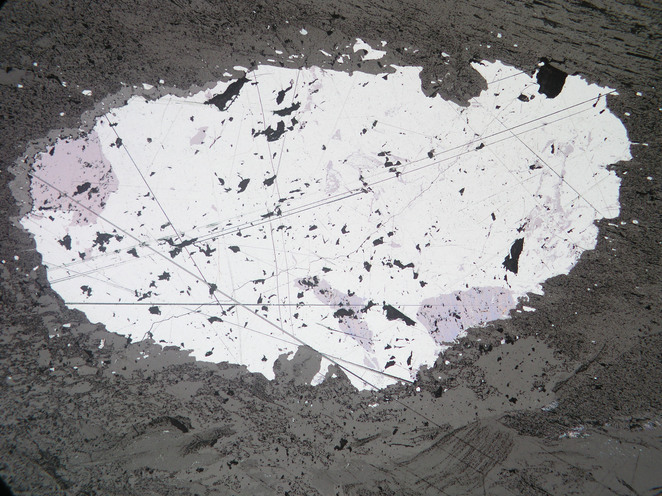 Grandfathered but inadequately described mineral; name may refer to both impure nukundamite, which was originally called "idaite", and to a tetragonal phase close to Sn-poor mawsonite (Rice et al., 1979). Digenite 2 photos of Idaite associated with Digenite on mindat.org. Charoite 1 photo of Idaite associated with Charoite on mindat.org. Aegirine 1 photo of Idaite associated with Aegirine on mindat.org. Pectolite 1 photo of Idaite associated with Pectolite on mindat.org. Nukundamite 1 photo of Idaite associated with Nukundamite on mindat.org. Frenzel, G. (1959): Ein neues Mineral: Idait, natürliches Cu5FeS6. Neues Jahrb. Mineral., Abh., 93, 87–114 (in German). American Mineralogist (1958): 43: 1219. American Mineralogist (1975): 60: 1013-1018. Rice, C. M., Atkin, D., Bowles, J. F. W. and Criddle, A. J. 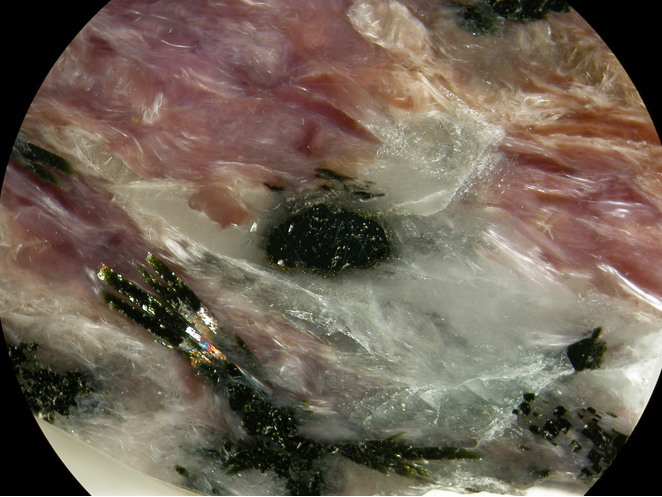 (1979): Nukundamite, a new mineral, and idaite. Mineralogical Magazine, 43, 193-200. Sugaki, A. Shima, H. Kitakaze, A. and Harada, H. (1975): Isothermal phase relations in the system Cu-Fe-S under hydrothermal conditions at 350°C and 300°C. Econ. Geol., 70, 806-823. El Gorsey, A., Yabuki, H., Ehlers, K., Woolum, D. & Pernicka, E. (1988). Qingzhen and Yamato-691: A tentative alphabet for the EH chondrites. Proceedings NIPR Symposium Antarctic Meteorites 1, 65-101. Mozgova, N.N., Borodaev, Y.S., Stepanova, T.V., Cherkashev, G.A., and Zhirnov, E.A. (2000): Lithology and Mineral Resources 35(1), 1-18. Base Metal Mineralisation at Mineral Hill Central Western New South Wales, by L. McClatchie 1971 - Memoirs of the Geological Survry of N.S.W. No. 11. Huber, S. und Huber, P. (1977): Mineral-Fundstellen Band 8: Oberösterreich, Niederösterreich und Burgenland. C. Weise Verlag, München, 270 pp. ; Huber, S. & Huber, P. (1981): Die Mineralien der Antimonitlagerstätte Schlaining, Burgenland. Die Eisenblüte, Jahrg. 2 NF., Nr. 3, 18-22. G. Niedermayr, I. Praetzel: Mineralien Kärntens, 1995; Paar, W. H., & Chen, T. T. (1982). Ore mineralogy of the Waschgang gold-copper deposit, Upper Carinthia, Austria. Tschermaks mineralogische und petrographische Mitteilungen, 30(3), 157-175. Hackenberg, M. (2003): Bergbau im Semmeringgebiet. Arch. f. Lagerst.forsch. Geol. B.-A., 24, 5-97. Tufar, W. (1966): N. Jb. Mineral. Abh. 105, 203-210. Vohryzka, K. (1968): Die Erzlagerstätten von Nordtirol und ihr Verhältnis zur alpinen Tektonik. Jb. Geol. B.-A., 111, 3-88.; Steiner, M., Tropper, P., Vavtar, F., Kaindl, R. & Krismer, M. (2010): Balkanite from the Cu ore deposit Röhrerbühel, Kitzbühel (N-Tyrol, Austria). N. Jb. Mineral. Abh. 187, 207-215. Bogdanov, K., Tsonev, D., and Kuzmanov, K. (1997): Mineralium Deposita 32, 219-229. Cioacă, M. E., Ivanov, D., Iorga-Pavel, A., Stoilov, V., Milu, V., Barbu, O., ... & Munteanu, M. (2018). Au-Ag-Bi mineralization at the Assarel porphyry copper deposit (Srednogorie metallogenic zone, Bulgaria). Advances of Geology in southeast European mountain belts, 276. Mladenova, V., Apostolova, R., & Ivanov, Z. (2017). Epithermal intermediate-sulfidation veins in the low-grade metamorphic rocks in the upper levels of the Elatsite porphyry copper deposit, Bulgaria. Review of the Bulgarian Geological Society, 78.
Henley, R. W., Mavrogenes, J. & Tanner, D. (2012): Sulfosalt melts and heavy metal (As-Sb-Bi-Sn-Pb-Tl) fractionation during volcanic gas expansion: the El Indio (Chile) paleo-fumarole. Geofluids 12, 199-215. Llaumet C./Henríquez F. (1976); "Faja de mineralización de oro, plata, cobre y arsenico en la Cordillera Andina de la III y IV región"; Primero Congreso Geológico Chileno, Vol. II. Anthony, Bideaux, Bladh, Nichols: "Handbook of Mineralogy", Vol. 1, 1990; American Mineralogist (1975): 60: 1013-1018. Economic Geology; 1996; v. 91; no. 1; p. 204-212; Colley, H., & Rice, C. M. (1975). A Kuroko-type ore deposit in Fiji. Economic Geology, 70(8), 1373-1386. Nurmi, P.A., Front, K., Lampio, E. & Nironen, M. 1984. Etelä-Suomen svekokarjalaiset porfyyrityyppiset molygdeeni- ja kupariesiintymät, niiden granitoidi-isäntäkivet ja litogeokemiallinen etsintä. Geologian Tutkimuskeskus, Tutkimusraportti 67, 88 s.
Chauris, L. (2014): Minéraux de Bretagne, Les Editions du Piat, 63. Briggs, R. M. (1975). Structure, metamorphism and mineral deposits in the Diahot region, northern New Caledonia. Thesis (PhD-Geology), University of Auckland, 1975. Kopp, J., Simon, A., Göthel, M. (2006): Die Kupfer-Lagerstätte Spremberg-Graustein in Südbrandenburg. Brandenburg. geowiss. Beitr., 13, 117-132.; Kopp, J. C., Spieth, V., & Bernhardt, H. J. (2012). Precious metals and selenides mineralisation in the copper-silver deposit Spremberg-Graustein, Niederlausitz, SE-Germany [Edelmetall-und Selenerze in der Kupfer-Silber-Lagerstätte Spremberg-Graustein, Niederlausitz, SE-Deutschland]. Zeitschrift der deutschen Gesellschaft für Geowissenschaften, 163(4), 361-384. Heider, J. 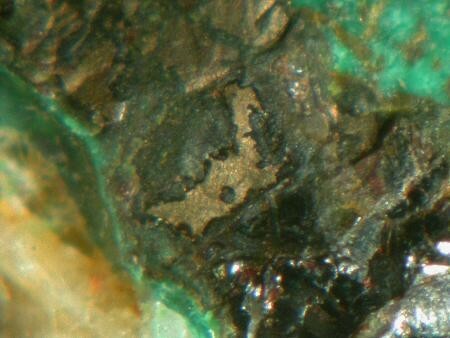 (2014): Die Selenidmineralisation der Grube Henriette. Aufschluss, 65, 216-226. Krupp, R.E. (1989) Paragenesis and conditions of formation of the Moschellandsberg mercury deposit, SW Germany. Mineralium Deposita, 24:2, 69-76. Econ Geol (1997) 92:535-550; Prendergast, K. (2003). Porphyry-related hydrothermal systems in the Estberg District, Papua, Indonesia (Doctoral dissertation, James Cook University). ⓘ Tsumeb Mine (Tsumcorp Mine) ? Mason, D. O. & Kobe, H. W. 1989. Fe-Cu-(Zn) sulphide deposits associated with ophiolites in Northland, a summary. Royal Society of New Zealand bulletin, 26. Krause, H. 1965: Contributions to the mineralogy of Norway. No. 33. Idaite, Cu5FeS6, from Konnerud near Drammen. Norges Geologisk Tidsskrift. 45, 417-421 (p.417); Neumann, H. (1985): Norges Mineraler. Norges Geologiske Undersøkelse Skrifter 68, p. 29. Neumann, H. (1985): Norges Mineraler. Norges Geologiske Undersøkelse Skrifter 68, 278 pp (p. 29). Bergstöl, S. & Vokes, F.M. (1974) Stromeyerite and mckinstryite from the Godejord polymetallic sulfide deposit, central Norwegian Caledonides. Mineralium Deposita 9, 325-337. Espi, J. O., Hayashi, K. I., Komuro, K., Kajiwara, Y., & Murakami, H. (2005). The Bilimoia gold deposit, Kainantu, Papua New Guinea: A fault-controlled, lode-type, synorogenic tellurium-rich quartz-gold vein system. In Mineral Deposit Research: Meeting the Global Challenge (pp. 941-944). Springer Berlin Heidelberg. Mochnacka, K., Oberc-Dziedzic, T., Mayer, W., Pieczka, A. (2012) Ore mineralization in the Miedzianka area (Karkonosze-Izera Massif, the Sudetes, Poland): new information. Mineralogia Polonica, 43:(3-4), 155-178. [Lapis 1993:4 p.13-20]; Pekov, I. (1998) Minerals First discovered on the territory of the former Soviet Union 369p. Ocean Pictures, Moscow; Henderson, C. M. B., Kogarko, L. N., & Plant, D. A. (1999). Extreme closed system fractionation of volatile-rich, ultrabasic peralkaline melt inclusions and the occurrence of djerfisherite in the Kugda alkaline complex, Siberia. Mineralogical Magazine, 63(3), 433-438. - Ferenc Š. & Rojkovič I., 2001: Copper mineralization in the Permian basalts of the Hronicum Unit, Slovakia. Geolines, 13, 22-27. Stalder, H. A., Wagner, A., Graeser, S. and Stuker, P. (1998): "Mineralienlexikon der Schweiz", Wepf (Basel), p. 223.
ⓘ Upper Tignausa vein ? GÜNER, M. (1980). Geology and massive sulfide ores of the Küre area, the Pontic Ranges, northern Turkey. Bull. Mineral Res. Explor, 93(94), 65-109. Çağatay, A., and Arman, B. (1989): Geological Bulletin of Turkey 32, 15-20. Oyman, T. (2010): Geochemistry, mineralogy and genesis of the Ayazmant Fe–Cu skarn deposit in Ayvalik, (Balikesir), Turkey. Ore Geology Reviews 37, 175-201. USGS (2005), Mineral Resources Data System (MRDS): U.S. Geological Survey, Reston, Virginia, loc. file ID #10310642. Econ Geol (1986) 81:1899-1931; Hayes, T. S., Landis, G. P., Whelan, J. F., Rye, R. O., & Moscati, R. J. (2012). The Spar Lake strata-bound Cu-Ag deposit formed across a mixing zone between trapped natural gas and metals-bearing brine. Economic Geology, 107(6), 1223-1249.
ⓘ Deer Trail Mine ?